Congratulations to Yandy and Mandeeces on their nuptials that was viewed by millions last night on VH1. 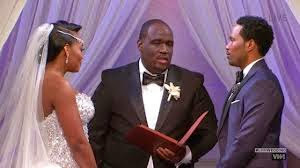 The couple have faced a lot of adversity during the last two seasons on Love and Hip Hop NY, especially pertaining to Mandeeces arrest and pending jail time. Last night we learned that he was facing 20 years if convicted of drug charges and apparently he has decided to take a pea deal of 5 years, so the couple still have and up hill battle. However they decided to proceed with the wedding and face their issues together. The concept and act of their union is the epitome of Love (black love) and a true character of marriage. We wish them well and hope they have long lasting happiness and understanding.